Anticipation for Stranger Things season 3 still high after nearly two years between seasons.. But thankfully, fans might not have to wait that long to revisit Hawkins and its inhabitants. Via The Verge, Del Rey Books will release Darkness on the Edge of Town. This canonical novel was written by Adam Christopher and it delves into the history of Police Chief Jim Hopper, one of the series’ most beloved characters. Borrowing its title from the Bruce Springsteen album of the same name, the book focuses on Hopper. It is set primarily in 1977, six years before the show’s first season, and it explores Hopper’s tenure as an NYC police detective. 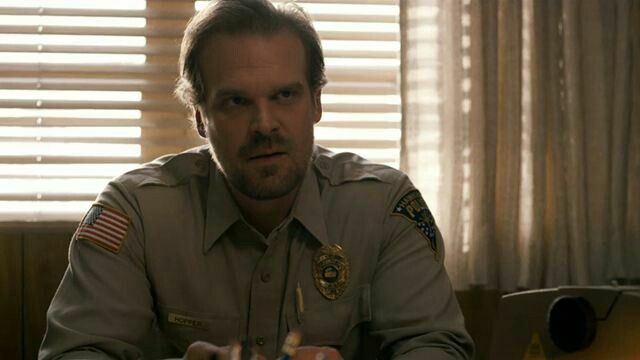 In a recent tweet, Netflix made it sound as though Hopper will be relaying these stories to his new adopted daughter, Eleven. You can read what the streaming service had to say and check out the book’s cover below. Another Stranger Things novel, Suspicious Minds, was released earlier this month. Unlike Christopher’s book, Suspicious Minds was written by Gwenda Bond and it takes place in 1969. Bond’s novel sheds light on how Eleven’s mother, Terry Ives, became a test subject for Hawkins Lab. Darkness on the Edge of Town will hit bookstores on June 4. Will you be reading the novel before Stranger Things returns on July 4? Let us know in the comment section below!